Up until now, the best memory standard you might have gotten for your graphics’ performance would have been DDR5. This is the highest value of double-data rate (DDR) type chips available to enhance video, multimedia or gaming, available on the highest end of devices. However, Samsung may have disrupted this market yet again with reports that their newest DDR memory for graphics (or GDDR) is now in production. It adheres to the new standard for such memory (GDDR6) and has already received recognition from technology insiders. However, these new chips are intended for consumer devices that extend beyond the conventional, which may imply the major Korean company’s beliefs as to where graphics-centric consumer trends are going. Samsung’s latest form of graphics memory is laid down on the 10nm die-size typical to the high-end processors released by this company these last few years. Each GDDR6 chip will pack 16GB of memory each. Therefore, this represents a significant upgrade over last year’s GDDR5 processors; their maximum capacity was 8GB, and they were laid out on 20nm processors. The newer chips should also continue the DDR trend of year-on-year reduced power consumption, as they only require 1.35V each to run, compared to 1.5V for GDDR5. The GDDR6 processors are also said to be able to transfer data at up to 16Gb per second, and run I/O at as much as 64GB per second. These impressive attributes have in fact won the new Samsung graphics chip the Innovation Award at CES this year. According to official statements released by Samsung, the company are aiming for the best performance in terms of processing speed and economy in power use with their new graphics chip. 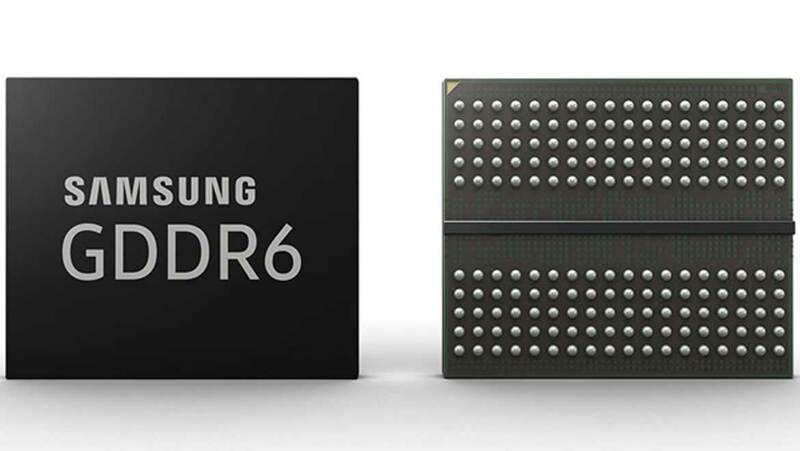 Other reports suggest that Samsung GDDR6 memory will be made available for use in the next generation of high-end consumer graphics card such as the NVIDIA Volta line. However, they may also be incorporated into devices and solutions that support upcoming trends in media consumption. These include cutting-edge augmented-reality installations, virtual-reality devices and 8K visual-media generation. The GDDR6 chips could also be compatible with the processing demands associated with upcoming artificial intelligence- (AI) based software products. GDDR6 processors may also have a place in settings where high transfer speeds or data volumes are involved, such as networking or traffic management. On the other hand, some may assert that the most advanced form of established graphics processing, known as GDDR5X, can match the new standard in terms of speed and performance. This may be good news for individuals or companies looking for powerful graphics processors without the price tags associated with brand-new hardware. However, GDDR6 is likely to come with an increased depth of optimisation compared to GDDR5X. In addition, some experts have claimed that the density of GDDR6 could be maxed out to 32GB by adding the JEDEC (Joint Electron Device Engineering Council) standard, whereas GDDR5X is known to be able to stretch to only half that number in response to the same. Therefore, GDDR5X at the top of its specification may only barely match up to GDDR6 of a standard configuration. In addition, GDDR5X can run at speeds of up to 12Gb per second (or up to 16Gb/s with JEDEC), whereas GDDR6 can beat that with a maximum of 14Gb/s (although its top JEDEC-enhanced speed remains at 16Gb/s). GDDR6 has two channels (configured at x8 or x16 per channel) compared to the single (x16 or x32) channel associated with GDDR5X. These specs have enabled tech correspondents to speculate that cards equipped with GDDR6 will easily surpass comparable models with GDDR5X chips. For example, the NVIDIA GTX1080 incorporates 256-bit GDDR5X memory, which means it has a bandwidth of 320 GB/s. A next-generation card with 256-bit GDDR6 technology at 12Gb/s (the processor’s possible lowest speed) would have a bandwidth of 384 GB/s. Furthermore, a GDDR6 card running at 16Gb/s and the emerging 384-bit standard could have a bandwidth of 768 GB/s. This is even superior to NVIDIA’s Tesla P100 card, which is powered by the enterprise-level HBM2 memory standard capable of a 4096-bit bus size. All of this indicates that discrete graphics powered by GDDR6 could be extremely powerful, especially when tuned to next-generation specifications. This may be good news for companies who want to offer increasingly complex, convincing VR solutions or environments, or other multimedia products that require powerful graphics. Therefore, Samsung may have a customer in Intel, who may need this kind of processing to offer the mixed-reality environments Windows may require in the future. Intel reportedly has plans to develop their own line of dGPUs, but it may be years before this objective is realised. In the meantime, GDDR6 may be the consumer-level solution for high-level graphics from 2018 on. It is still not clear when cards powered by this new standard will hit the market; however, Samsung have confirmed that they started production on this new line in January. Therefore, it should not be too long before shoppers can get their hands on upgrades for their existing cards… presuming they have the money to do so. It is clear that GDDR6-powered GPUs are the next big thing for gamers (particularly those into VR), AR developers and networking concerns. Depending on their configurations, the next generation of cards may be able to beat other premium standards, even those of the HMB variety in some cases. The term ‘GDDR6’ will definitely be something to look out for when selecting your next high-end computing solution. New Removable Implants for Type 1 Diabetes?